‘Electricity’ emerged as one of the first songs that Andy McCluskey and Paul Humphreys wrote together. Influenced by German electronic pioneers such as Can, Neu! and Kraftwerk, ‘Electricity’ yielded a simple yet infectious electro-pop melody which would later become a well-established OMD classic. 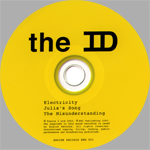 ‘Electricity’ got its first public airings during live performances of pre-OMD outfit The Id. But with the Id’s demise, Andy and Paul began looking for interest in their new project which had gained the unlikely name of Orchestral Manoeuvres In The Dark. Recruiting the help of local friend Paul Collister, Andy and Paul retired to his garage-studio (which Collister had named Henry’s Studio). There, with the help of ‘Winston’ (a 4-track reel-to-reel tape recorder also owned by Paul Collister), the band recorded a two track demo tape (which included ‘Almost’). Andy and Paul began sending copies to local record labels and radio stations, including Manchester’s Factory Records. In fact, Factory supremo Tony Wilson might have passed on the band, but his wife liked the songs. After agreeing to cutting a single on the Factory label, Tony Wilson suggested that Andy and Paul go into the studio with Factory producer Martin Hannett to polish up the sound. The Cargo Studios version. Also features on the remastered edition of OMITD released in 2003. This led to some debate between the band and Tony Wilson over which versions of the songs to include. Wilson favoured Hannett’s polished versions while Andy and Paul, not convinced by Hannett’s over-lush production, wanted the original versions. A compromise was struck so that OMD’s version of ‘Electricity’ was picked, but with Hannett’s polished production of ‘Almost’ on the flipside. With his art college training, Andy had already designed several posters for the band’s gigs. As a result, he also wanted a hand in designing the record sleeve. But Tony Wilson instead suggested Peter Saville who had already done design work for Factory – including posters and the Factory Sampler EP. Peter Saville met with Andy and Paul to discuss the design aspects of the single and Saville mentioned a book he’d discovered in a library – a collection of avant-garde musical scores which were written in an unusual shorthand rather than musical notation. Andy and Paul could not read or write music themselves, but wrote their songs in a similar shorthand fashion so the idea seemed attractive. For the classical typeface used in the sleeve design, Saville had been inspired by 30’s designer Jan Tschichold, especially by the formal typeface that Tschichold had used in the 1940’s. The idea of the ‘black on black’ sleeve had developed from Peter Saville’s interest in thermography printing using special high temperature methods to create an embossed effect. When the sleeves for ‘Electricity’ came to be printed, the high temperatures used in the printing process managed to set the printers on fire three times! As a result, the print company called a halt after 5,000 copies – hence the ‘Limited Edition’ tag for OMD’s debut single. ‘Electricity’ failed to make a favourable impact on the charts, despite being praised by the likes of Radio 1′s John Peel, but it helped to establish OMD as a credible outfit. It also attracted the interest of the Virgin subsidiary DinDisc, notably by the inclusion of Paul Collister’s phone number on the sleeve! OMD signed to DinDisc and they agreed to reissue ‘Electricity’, but this time using the Hannett mixes. They also reissued the single in a new glossy sleeve (featuring studio credits on the back) that retained Saville’s original design, but did away with the complex thermographic printing. Despite DinDisc’s promotion, the single still failed to be the chart success the label had hoped for. A third release was issued in 1980 (tying in with the debut album’s release). This version of ‘Electricity’ remixed the Hannett version to produce a much more dynamic sound. Despite this, the single yet again failed to make a significant chart impact. Regardless of its commercial failure, ‘Electricity’ had swiftly become a fan-favourite and was regarded as the highlight of any OMD live performance. The Ridge Farm version. Also features on the remastered edition of Organisation released in 2003. However, Andy and Paul never seemed to be completely happy with the various versions of ‘Electricity’ and were always tempted to experiment with the song. During the Organisation sessions at Ridge Farm Studios they recorded yet another version of ‘Electricity’, this time with producer Mike Howlett. The new version actually boasts a different middle-eight from previous recordings and is totally unique. 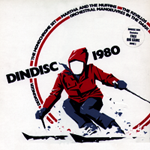 The track was featured on the DinDisc compilation album DinDisc 1980 – an album that helped promote DinDisc’s growing stable of artists which also included Martha And The Muffins. 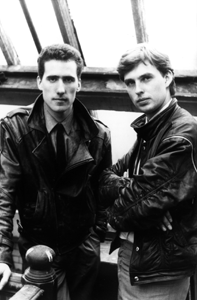 For the 1988 Best of OMD album, the band realised the limitations of the early recordings of ‘Electricity’ and considered some drastic solutions in a bid to clean up the sound – including overdubbing the drumming onto the existing mix. In the end, they just settled for a more polished remix which didn’t sacrifice the energy and feel of the original song, but helped to polish up the rough edges. ‘Electricity’ briefly emerged as a live track on the B-Side of ‘Everyday’ in 1993 (performed right after they managed to blow a generator on stage supporting Simple Minds at Milton Keynes!) but the next recorded version of ‘Electricity’ arrived in 1998 with the OMD Singles album. Both the limitations of the original performance and recording of ‘Electricity’ were thrown into sharp relief by the polished precision of the 90′s recordings that were up for inclusion on the OMD Singles album. Despite this, a more rounded mix was coaxed out of the original tapes. But it was the OMD Remixes EP that ‘Electricity’ received its most radical reworking by contemporary artists The Micronauts. Despite featuring samples from ‘Bunker Soldiers’, this version is generally hated by OMD fans although Andy McCluskey appreciated the fresh take on the song. The release of the remastered B-Sides compilation Navigation in 2001 presented an opportunity for OMD to reassess their catalogue of songs – and look at reissues for their most classic albums. As something of a tester, Andy McCluskey arranged for a limited edition release of tracks recorded by The Id back in 1978 during the Open Eye Gallery sessions. This included The Id’s take on ‘Electricity’. As mentioned in our feature on The Id, this wasn’t an easy task as the quality of the original recordings was quite poor – especially on ‘Electricity’. This led to a disclaimer on the sleeve stating that ‘Electricity’ had to be electronically enhanced but that there was still some “stereo phase incoherence”. Bolstered by the interest in both Navigation and The Id releases, Virgin looked at remastering the first three OMD albums. But as a bonus for OMD fans the reissued versions of Orchestral Manoeuvres In The Dark, Organisation and Architecture & Morality also featured additional tracks which had previously never been available on CD before. 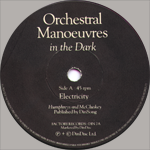 The reissued Orchestral Manoeuvres In The Dark included the original Cargo Studios recording of both ‘Electricity’ and ‘Almost’, while the reissue of Organisation featured the Ridge Farm version of ‘Electricity’ (which had previously only been available on the DinDisc 1980 vinyl release). So despite various recordings, remixes and versions, ‘Electricity’ still remains a simple and melodic pop song – and possibly the most classic OMD track. This is a revised and updated version of an article that originally appeared in issue 1 of Messages.